TO OUR BELOVED HOLY FATHER! (official Church holiday) for St. Benedict. one of those pictures where he appears like an archangel out of the Bible. Too bad I can't enlarge it any farther. the livelihood of small farmers around the world. availability to preach the Gospel throughout the world." It is almost 2 p.m. Rome time, but the Vatican has not issued any bulletin on scheduled events today for the Holy Father. The Holy Father addressed Thursday a third group of prelates from the Argentine Episcopal Conference, who have just completed their "ad limina" visit. Dear brothers in the Episcopate! 1. It is with great joy that I meet again with this group of Pastors from the Church in Argentina, which concludes your ad limina visit. I greet you all with affection and I wish that this fraternal meeting with the Successor of Peter may help you feel the pulse of the Universal Church and to consolidate the ties of faith, communion and discipline that unite your local churches to the Apostolic See. At the same time, I thank the Lord for this new occasion to confirm my brothers in the faith (cfr Lk 22,32), and to share your joys and concerns, in your successes and difficulties. With all my heart, I am grateful for the kind words addressed to me, in the name of you all, by Mons. Luis Héctor Villalba, Archbishop of Tucuman and vice-president of the Argentine bishops' conference, who expressed your sentiments of affection and adherence, along with those of your priests, religious, and the lay faithful of your communities. 2. Dear brothers, the Lord Jesus has entrusted to us a ministry of the highest value and honor: to bring his message of peace and reconciliation to all peoples; to care, with paternal love, for the holy People of God and to lead them along the path of salvation. This is a task that is beyond our personal merits and our lowly human capacity, but to which we dedicate ourselves with simplicity and hope, sustained by the words of Christ, "It was not you who chose me, but I who chose you and appointed you to go and bear fruit that will remain" (Jn 15,16). Jesus, the Master. looking at you with the love of a brother and friend, has called you to enter into his intimacy, and consecrating you with the sacred oil of priestly unction, he has placed in your hands the redeeming power of his blood so that, with the certainty of acting always in persona Christi capitis [in the person of Christ the Head], you may be in the midst of the people that has been entrusted to you by "a living sign of the Lord Jesus, Pastor and Spouse, Master and Pontifex of the Church" (John Paul II, Pastores gregis, 7). In the exercise of his episcopal ministry, the Bishop should always behave among his faithful as someone who serves (cf Lumen gentium,27), constantly inspired by the example of He who did not come to be served but to serve and give his life as ransom for the many (cf Mk 10,45). Truly, to be a bishop is a title of honor when one lives in this spirit of service to others in humble and disinterested participation in the mission of Christ. The frequent contemplation of the image of the Good Shepherd will serve you as a model and inspiration in your efforts to announce and disseminate the Gospel, it will impel you to care for the faithful with tenderness adn mercy, to defend the weak adn to spend your life in constant adn generous dedication to the People of God (cf Pastores gregis, 43). 3. As an essential part of your episcopal ministry in the Church, true amoris officium (cf St. Augustine, In Io. Ev., 123,5), I wish to exhort you to foment in your diocesan communities the exercise of charity, especially for the neediest. Through your nearness and your words, with material help and with prayers, with a call to dialog and to the spirit of understanding which always seeks the common good of the people, and with the light that comes from the Gospel, you must give concrete and visible testimony of the love of Christ among the people, in order to continually construct the Church as the family of God, always welcoming and merciful with the poorest, so that in all dioceses, charity may reign in compliance with what Jesus ordered (cf Christus Dominus, 16). Along with this, I also wish to insist on the importance of prayer in the face of activism or a secularized vision of Christian charitable service (cf Deus caritas est, 37), That assiduous contact with Christ in prayer transforms the heart of believers, opening it up to the needs of others, without being inspired, however, "by ideologies aimed at improving the world, but should rather be guided by the faith which works through love" (ibid., 33). 4. I wish to commend to you especially the priests, your closest co-workers. May the embrace of peace with which you welcomed them on the day of their priestly ordination, be a living reality every day that contributes to increasingly tighten the bonds of affection, respect and confidence that unites you to them by virtue of the sacrament of Holy Orders. In acknowledging the abnegation and commitment to the ministry of your priests, I also wish to invite them to an ever greater identification with the Lord, becoming true models for the flock for their virtues and good example, pasturing the flock of God with love (cf 1 PS, 2-S). 5. The specific vocation of the lay faithful leads them to try and configure their social life correctly to illuminate earthly realities with the light of the Gospel. May these secular faithful, conscious of their baptismal promises, and inspired by the charity of Christ, participate actively in the mission of the Church as well as in the social, political, economic and cultural life of the nation. In this sense, Catholics should stand out among their fellow citizens for their exemplary compliance of their civic duties, as well as for the exercise of those human and Christian virtues which contribute to improve personal, social and work relations. Their commitment should also lead them to promote in particular those values which are essential to the common good of society, such as peace, justice, solidarity, the good of the family founded on matrimony between a man and a woman, the protection of human life from conception to natural death, and the right and obligation of parents to educate their children according to their moral and religious convictions. I wish to conclude by asking you to bring my affectionate greeting to all the members of your diocesan churches. To the emeritus bishops, priests, seminarians, religious men and women, and all the lay faithful, tell them that the pope thanks them for their work for the Lord and the cause of the Gospel, and that I hope and trust in their fidelity to the Church. To you, dear Bishops of Argentina, I thank you for your pastoral solicitude and I assure you of my spiritual closeness and my constant prayers. I commend you from the heart to the protection of Our Lady of Lujan and I impart to you a special Apostolic Blessing. 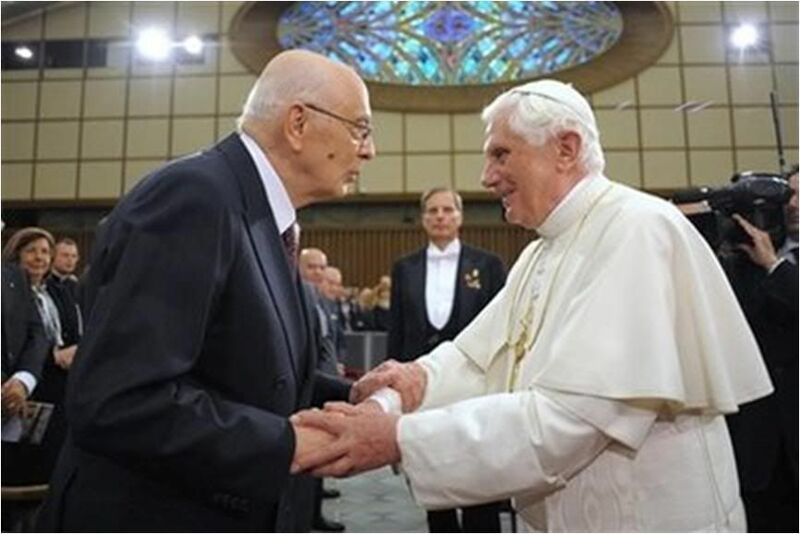 At 5:30 on Thursday afternoon, April 30, the Holy Father attended a concert at the Aula Paolo VI offered by the President of Italy, Giorgio Napolitano, on the occasion of the fourth anniversary as Pope. President Napolitano performed the same gracious gesture for the Pope on the third anniversary last year after he came back from his trip to the United States where he marked the actual date while he was in New York. The Pope and the President have a brief chat before the concert. The concert was performed by the Verdi Orchestra and Chorus of Milan conducted by Xian Zhang and Erina Gambarini, respectively. The program featured Haydn's Symphony No. 95, Mozart's Haffner Symphony, Vivaldi's Magnificat in G-minor, and Mozart's Ave Verum Corpus. In addressing to all my heartfelt greeting, I express my most sincere gratitude to the President of the Italian Republic, the Honorable Giorgio Napolitano, who, on the occasion of the fourth anniversary of the start of my Pontificate, has offered me this excellent musical homage. Thank you, Mr. President, for this and for the kind words that you addressed to me just now, and an affectionate greeting to your gracious wife. I am happy to greet the Ministers and other authorities of the Italian State, as well as the ambassadors and other personalities who honor us with their presence. I was very pleased at the return of the Giuseppe Verdi Orchestra and Chorus of Milan, whom we appreciated last year. As I thank the Verdi Foundation and those who contributed in various ways to organizing this concert, I renew my congratulations to all the orchestra and chorus members, particularly the conductor, Mademoiselle Zhang Xian, and chorus master Erica Gambarini, as well as the three soloists. The mastery and enthusiasm of each has contributed to an execution which truly gave new life to the pieces offered, the works of three composers of the first order: Vivaldi, Haydn adn Mozart. I found the choice of the numbers very appropriate to the liturgical time we are going through - Eastertide. Haydn's Symphony #95 which we heard first seems to contain in itself an itinerary which we might call 'Paschal'. Indeed, it starts in the tonality of C-minor, and through a development that is perfectly equilibrated, but not without drama, it reaches its conclusion in C-major. This recalls the itinerary of the soul - represented particularly by the cello - towards peace and serenity. Shortly afterwards, Mozart's Symphony Number 35 amplifies and crowns the affirmation of life over death, of joy over sadness. Indeed, the sense of celebration dominates. The tempo is very dynamic and in its finale, truly overwhelming - and in this, our orchestral virtuosi have made us feel how strength can harmonize with grace. It is what happens to the maximum degree, if you will allow me this comparison, in God's love, in which strength and grace coincide. Then the human voice enters the scene, so to speak: the choir, almost as if to give words to what the music has expressed. It is not by chance that the first word was 'Magnificat'. From the heart of Mary - who was favored by God for her humility - this word has become the daily song of the Church, precisely at this Vespers hour, the time that invites to meditation on the sense of life and of history. Clearly, the Magnificat presages the Resurrection, the victory of Christ: in him, God fulfilled his promises, and his mercy was revealed in all its paradoxical power. Thus, the 'word'. And Vivaldi's music? First of all, it is noteworthy that he composed the soloists' arias expressly for some singers who were his pupils at the Venetian hospital of La Pieta - five orphans gifted with extraordinary singing abilities. How can we not think of Mary from whom God drew 'great things'? Thus, these five soloists almost represent the voice of the Virgin, while the chorus expresses the Church-community. Together, Mary and the Church are united in the single canticle fo praise to "the Holy", to God, who with the power of love, realizes his plan of justice in history. Finally, the Chorus gave voice to that sublime masterpiece that is Mozart's Ave verum Corpus. Here, meditation gives way to contemplation: the eye of the mind fixes itself on the Most Blessed Sacrament to recognize the Body of Christ, that Body which was truly immolated on the Cross and from which flowed forth the spring of universal salvation. Mozart composed this motet shortly before his death, and in it, one can say that music has become true prayer, the abandonment of the heart to God, with a profound sense of peace. Mr. President, your kind and generous homage has succeeded amply not only to gratify the aesthetic sense, but at the same time, to nourish our spirit, and for this I am doubly grateful to you. I express my best wishes in the continued execution of your high mission, and I extend that similarly to all the authorities present. Dear friends, thank you for coming today. Remember me in your prayers, so that I may always fulfill my ministry as the Lord wishes. May he who is our peace and our life bless all of you and your families. I wish you all a good night. Religious leaders representing the local Muslim, Catholic, Jewish and Protestant communities met at the Notre Dame Cultural Center in Jerusalem on Thursday to voice their expectations of the Pope during his visit to the Holy Land. Dr. Munib Younan, head of the Evangelical Lutheran Church in Jordan and the Holy Land, said he hoped Benedict XVI would support a two-state solution and reject "occupation and settlements." "The security of Israel is important to us," Younan said. "And this security depends on a just treatment of the Palestinian people. Jerusalem should be a city shared by all religions and serve as a model of peaceful religious coexistence. There are extremists on both sides who are trying to turn the conflict into a religious war. Religion must instead be a source of inspiration for peaceful coexistence." The symposium was sponsored by the US State Department; Mercy Corps, a nondenominational Portland, Oregon-based aid organization; and the Inter-Religious Coordination Council in Israel, a coalition of 70 Christian, Muslim and Jewish groups. Father William Shomali, rector of the Latin Seminary in Bet Jala, near Bethlehem, said he hoped the Pope would help Jews, Christians and Muslims to recognize the suffering of "the other." "The Pope will visit Yad Vashem to recognize the suffering of the Jews, he will visit with the Armenians to remember their suffering and the 1.5 million who were killed, and he will also devote time to acknowledging the Palestinian people's suffering," Shomali said. "I hope the Holy Father will help all of us escape our complexities of victimization. Part of the process of reconciliation is admitting one's guilt." Shomali, a Palestinian, called the present state of Israeli-Palestinian dialogue "an exercise in futility." "Like Joshua in the Old Testament, we must break down the walls, all of the invisible barriers such as fears, phobias and hatred that prevent us from making peace." Shomali recalled how during the visit of Pope John Paul II in 2000, suspicion between Muslim and Jewish religious leaders foiled attempts at religious dialogue. "Until the last minute it was unclear whether the grand mufti of Jerusalem would arrive," Shomali said. "Neither rabbis nor muftis were willing to submit their speeches in advance. And they refused to join the Pope in a tree planting ceremony. "And each side spoke exclusively about their own suffering." Prof. Mohammed Dejani, founder and director of the American Studies Institute at Al-Quds University in east Jerusalem and founder of Wasatia, a new organization for the promotion of peace, said that "extremists have taken power on both [the Israeli and Palestinian] sides." "Religion should lead politics, not the other way around," Dejani said. "The Pope should take the initiative in this endeavor." Dr. Deborah Weissman, co-chairwoman of the Inter-Religious Coordination Council, said she hoped the Benedict's "ambivalence" on theological issues affecting Jews would be clarified. "Recently there have been certain errors in judgment made by the Vatican regarding the Jewish people," Weissman said, apparently referring to the Pope's attempt to heal a schism in the Catholic Church by readmitting four renegade bishops in January. The four had broken with the Church over the Vatican II reforms. One of them, Richard Williamson, is a Holocaust denier. Weissman said she understood the tensions within the Church but added that she expected to hear a clear message from Benedict. 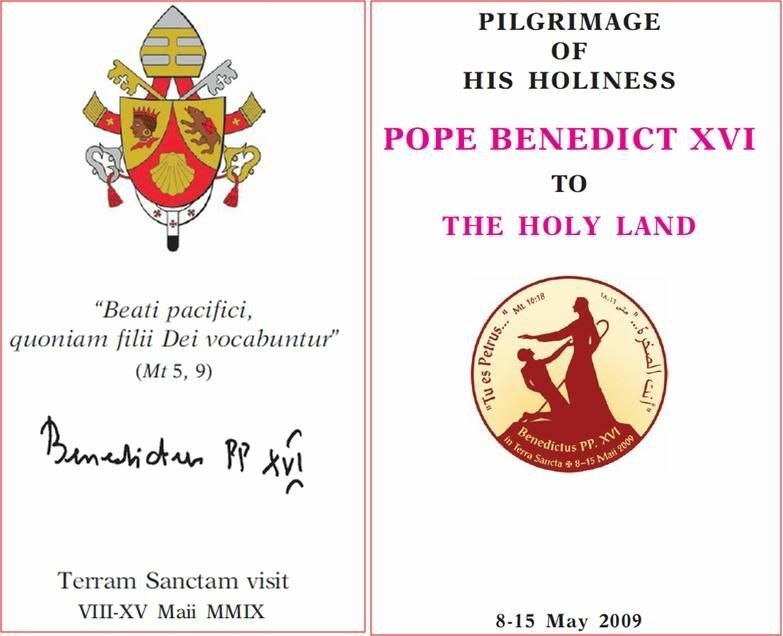 JERUSALEM, APRIL 30, 2009 (Zenit.org).- More than a hundred rabbis of various denominations will sign a message welcoming Benedict XVI to the Holy Land and encouraging dialogue between Jews and Christians. The presidents of the International Foundation for Interreligious and Intercultural Education, Adalberta and Armando Bernardini, told ZENIT that the message is due to be published on the Web site of an Israeli newspaper Haaretz. The initiative is being promoted by one of the foundation's members, Rabbi Jack Bemporard, also director of the New Jersey based Center for Interreligious Understanding. From May 8 to 15 the Pope will visit the Holy Land, Jordan, Israel and the Palestinian territories, in a visit described by the government of Israel as a "bridge for peace." The Rabbi message, titled "United in Our Age," is inspired by Nostra Aetate, the statement that the Second Vatican Council issued on October 28, 1965, which motivated closer relations between Jews and Catholics. In particular, the message cites the document that states: "Since the spiritual patrimony common to Christians and Jews is thus so great, this sacred synod wants to foster and recommend that mutual understanding and respect which is the fruit, above all, of biblical and theological studies as well as of fraternal dialogues." Addressing the Pontiff, the message affirms: "In this spirit, we -- rabbis and Jewish leaders -- warmly welcome you and your mission of peace to Israel. "With one voice, we are united in our commitment to interreligious dialogue, to opening more paths to increased understanding, and to continually recognize and strengthen the important relationship between Catholics and Jews worldwide." "And where better to reaffirm that relationship," it adds, "than in the Holy Land of Israel, a place both religions treasure as part of a shared heritage." Excuse me, but did AP really expect the Muslims to be jumping for joy? I doubt whether the ordinary Muslim even cares that the Pope is visiting, unless he is prodded and drawn into any mass hysteria! But the way this item describes the Muslims of Nazareth is very disheartening, if not alarming for the Pope's security. The Pontiff may have to tread carefully with his visit to Nazareth. Many Muslims are still angry over a 2006 speech in which Benedict quoted a medieval text depicting the prophet as violent. The banner was put up by followers of Nazem Abu Salim, a radical Muslim preacher, right next to the Church of the Annunciation, where tradition says the Angel Gabriel told Mary she would give birth to Jesus. It is there for the Pope, Abu Salim said. "He is not welcome here." 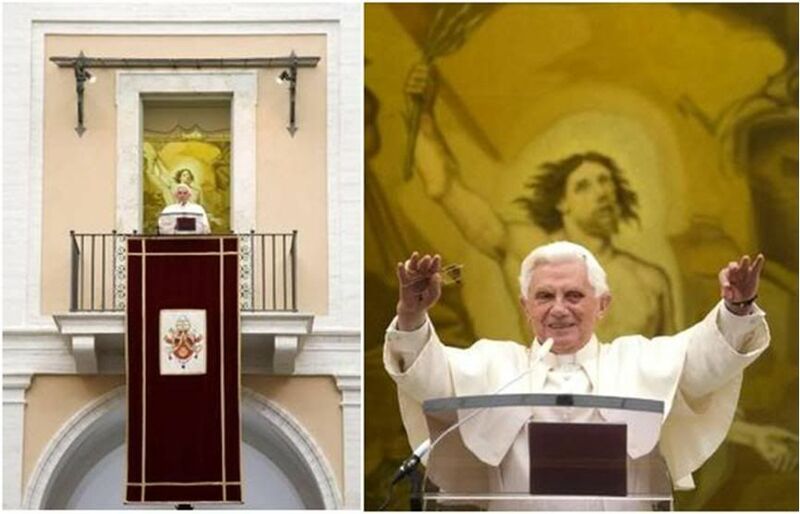 The banner — clearly visible from the church, which Benedict is to visit — trumpets a verse from the Quran declaring, "Those who harm God and His Messenger — God has cursed them in this world and in the hereafter, and has prepared for them a humiliating punishment." Municipal official Suheil Diab wouldn't say if the banner, along with a small sign in English with the verse, would be removed before the pope arrives May 14. Benedict plans to meet with Muslim leaders, though not Abu Salim, throughout his May 8-15 tour of the Holy Land, which includes stops in Jordan, the West Bank, Jerusalem and Nazareth, one of Israel's largest Arab cities. Islamic leaders in Israel are divided over the visit. One of the leading Muslim groups in Israel, the Northern Islamic Movement, is calling for a boycott of meetings unless Benedict apologizes for his 2006 remarks, said a spokesman, Zahi Nujeidat. The movement, which has not been invited to meet with the Pontiff, can marshal thousands of supporters, but has not yet decided whether to stage protests. Other Muslim clerics said they would sit down with Benedict but ask for an apology. One of those is Sheik Taysir Tamimi, a leading cleric in the Palestinian Authority, which has welcomed the Pope's trip. Muslims are a growing and increasingly assertive majority in Nazareth, which is 70 percent Muslim but has a communist mayor from the city's Christian community. A decade ago, brawls erupted over Muslim attempts to build a mosque beside the Church of the Annunciation. The project was eventually thwarted. What remains is a stone-paved square and a small mosque, headed by Abu Salim. Nazareth is one of the main cities for Israel's Arab minority, who make up around 20 percent of the country's 7 million people. Christians number around 120,000 of the Arab community, roughly half Catholic, half Eastern Orthodox. Benedict's 2006 speech citing an obscure medieval text that characterized some of Muhammad's teachings as "evil and inhuman" sparked protests in the West Bank and Gaza — though not in Israel. Attackers fired guns and threw firebombs at Palestinian churches. Benedict later said the text did not reflect his views, but many Muslims believe he did not apologize properly. In Nazareth, the Pontiff is to visit the Church of the Annunciation, host an interfaith discussion and meet with Israeli Prime Minister Benjamin Netanyahu. He'll also celebrate Mass on nearby Mount Precipice, where many Christians believe a mob pursued Jesus and tried to throw him from a cliff. The Pope will strive to improve interfaith relations throughout his tour, said Wadi Abunassar, a spokesman for the Pontiff's visit. Nazareth's local government has set aside $5 million to spruce up the crowded, shabby city overlooking the Galilee hills, hoping the papal visit will boost tourism, Mayor Ramiz Jaraisy said. Few in Nazareth's bazaar show any excitement, however. Many remain bitter over Israel's offensive in Gaza against Hamas militants, which killed more than 1,000 Palestinians in December and January. "People here are tired and exhausted from this situation," said Amin Ali, 72, an antique seller who described himself as a secular Muslim. "And nobody likes this Pope, anyway." Benedict should use his visit to censure Israel over Gaza and the lack of progress in reaching peace with the Palestinians, said Ateek, the Anglican reverend. on Friday, Sept. 22, 2006. 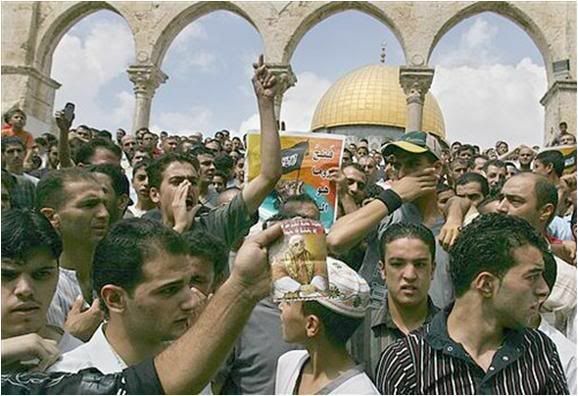 NAZARETH, April 30(IsraelNN.com) - Muslims led by a radical imam in the town where Jesus was said to be raised are not pleased at the prospect of a visit from the Pope, and have prepared a special insult with which to greet him. Radical Imam Nazem Abu Salim inspired his followers to string up a banner across the main square of Nazareth with a blatant warning for Pope Benedict XVI: "Those who harm G-d and His Messenger – G-d has cursed them in this world and in the hereafter, and has prepared for them a humiliating punishment." The words, lifted from the Koran, are translated into English in a small sign next to the banner, which is visible from the Church of the Annunciation, one of the sites the Pontiff will visit on May 18. The Nazareth municipality has allocated some $5 million to upgrade its facilities in anticipation of the visit, hoping it will spark new tourism revenues, according to Mayor Ramiz Jaraisey, a Christian. But another city official, Sueil Diab, refused to tell the AP reporter whether the offensive banner and sign would be removed before the Pope arrives. More than half of the city's population – 70 percent – is Muslim, and has a record of occasionally intimidating the shrinking Christian community. Relations have been tense between the two populations, particularly ten years ago, when Muslims attempted to build a mosque next to the church. Fist fights eventually put an end to the project, leaving a stone-paved square and a smaller mosque that serves Abu Salim's group. The radical Northern Islamic Movement has called on all Muslim leaders to boycott interfaith meetings that are to be held throughout the Pope's visit to the region from May 8-15, unless he apologizes for remarks he made during a speech in 2006. The Pope will meet with Prime Minister Binyamin Netanyahu and host an interfaith discuss while in Nazareth, and will celebrate Mass on nearby Mount Precipice. Benedict XVI will also be making stops elsewhere in the Palestinian Authority (PA) territories, as well as in Jerusalem and Jordan. The Muslim anger at the pontiff is connected to his citation of an obscure medieval text that characterized some of the teachings of the founder of Islam as "evil and inhuman." Benedict did not endorse the text, and made it clear that it did not reflect his own views, but Muslims insisted he issue a formal apology for using the citation, violently protesting and rampaging through streets in cities around the world. Muslims attacked churches in the PA as well, firing guns and hurling firebombs at the buildings and worshippers. The Czech bishops conference has opened an English-language site for the papal visit in September. Although no official announcement has been made, the site banner indicates that the Pope will be visiting Prague, Brno and Stara Boleslaw. All the material posted here today comes from the site. The motto and logo of the papal visit express its theme and spirit, as well as the general Christian attitude. The motto is: 'Love of Christ is our strength'. Christianity doesn't push itself by power, it doesn't struggle for gaining dominance over anyone. It respects the freedom of every person, but it is strong and firm, in trying to win over evil through the power of love. The logo expresses that we are bearers of the tradition of Prince Wenceslaus (represented by the heraldic symbol of the eagle), patron saint of the Czech nation, who promoted Christian values. We stand by his flag as a sign of our nation's spiritual life. The flag's spear is directed upwards, to permanent values and noble aims, and it bears the colours of the Czech Republic (blue - red - white) and of the Vatican (gold - white), because the journey is also a state visit, with the Czech nation welcoming one of the most important persons in the world, the leader of the Catholic Church. The commemorative medal will be a present to VIP guests as well as a valuable souvenir for visitors. It is available in gold or silver (both 0.999 purity). It was designed by Daniela Kartáková (born 1965), a well-known sculptor, conservator and medalist, who also designed the commemorative medal for John Paul II's 2005 visit to the Czech Republic. She also has a home in Carrara, Italy, site of one of the world's best marble quarries. 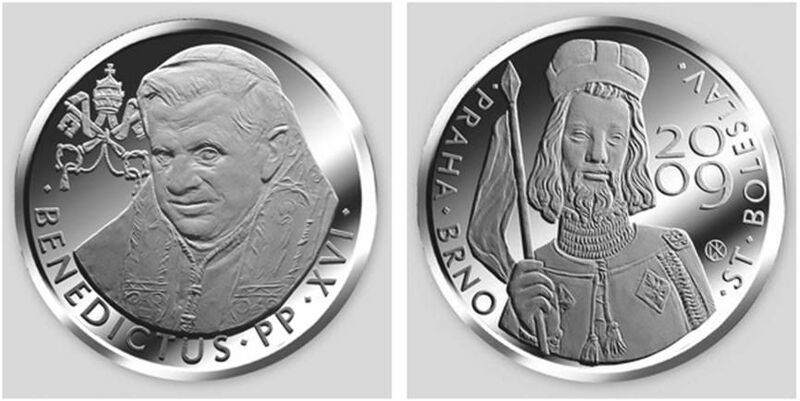 The front features a portrait of Benedict XVI with his Latin name, and the Vatican coat-of-arms. The back depicst St. Wenceslas, based on the Gothic statue of the saint by Petr Parléř in the Prague cathedral. The inscription gives the year of teh visit and the names of the three cities to be visited by the Pope. More information on the medal is available at the website about the medal, www.medaile-benediktxvi.cz (CZ), where it may also be ordered. This is the Preface written by Cardinal Ruini, himself an outstanding theologian, for the new 832-page book that puts together various texts by Cardinal Ratzinger and then Benedict XVI on the themes of faith, reason, love and truth. The theologian then Cardinal Joseph Ratzinger, now Pope Benedict XVI, has occupied himself with theology practically his whole life and is certainly one of the most elevated and significant voices of contemporary theology, who, with his election to the Pontifical office, has acquired further extraordinary authoritativeness. It is a good rule, when we seek to grasp the overall sense of a great human and intellectual undertaking, to inform ourselves first of how the author conceives it himself. Very indicative in this respect are two brief statements by Joseph Ratzinger-Benedict XVI. The liturgy of the Church has been for me, since my infancy, the central activity of my life, and has also become....the center of my theological work. But this question also includes right from the beginning the other one on the right response to give to God, and therefore, also the question of divine service. Sacred Scripture, the Fathers of the Church, and liturgy are therefore the vital humus of Ratzinger's theological reflections, and from this basis, he faces, without half measures, the question of truth - and of beauty and 'livability' [vivibilita, i.e., the possibility of living something], that of the Christian faith, in the actual historical situation and in relationship to other forms of rationality and other modalities of understanding the prevailing ways of living today. The Absolute - which the Greek philosophers had acknowledged in some way, although they considered it inaccessible to men - is really the God of man, the God who speaks to us and listens to us, the God who in Jesus Christ gave himself totally for us. Thus, between faith and reason there exists a profound and indestructible relation, and Christianity can rightfully present itself as the 'true religion'. Moreover, since the divine Logos is identical to the Agape - the original Love which is the measure of authentic love - Christian truth therefore finds its concrete expression in the ethic of love for one's neighbor, in caring for those who suffer, for the poor and for the weak, beyond any differences in social conditions. Thus, the force which allowed the missionary expansion of Christianity resides in the synthesis that it was able to realize between reason, faith and the praxis of life. This synthesis - linked to Christianity's claim to truth - has held up through the centuries and the succession of cultures, but in the modern era, both appear to be overwhelmed. "At the end of the second millennium," wrote Cardinal Ratzinger in the book Fede Verita Tolleranza [Faith, Truth, Tolerance], "Christianity finds itself - precisely in the place of its original diffusion, Europe - in a profound crisis, based on the crisis of its claim to truth". The central commitment of the theological work of our current Pope has been essentially how to emerge from this crisis. To this end, he has analyzed repeatedly the historical reasons for the present difficulty, not concealing those that come from within Christianity and the Church itself. With the passing of the centuries, indeed, Christianity had unfortunately become largely human tradition and state religion, contrary to its own nature. It is therefore a merit of the Enlightenment to have re-proposed - mostly in opposition to the Church - those values of rationality and freedom that are nourished by the Christian faith. But Ratzinger's attention has been addressed to opening the faith to the roads of the future, rather than merely analyzing the past. "To widen the spaces of reason" is the formula for his fundamental direction. Scientific rationality, based on experiment and calculation, and historical criticism - although both are important and irrenunciable - cannot by themselves satisfy man's desire to know and to give sense and direction to our existence. Concretely, Ratzinger questions both the attempt to make the theory of evolution [biological] an explanation which seems to be, at the least, potentially universal and self-sufficient to explain all of reality, as well as the tendency of historical criticism to reduce teh figure of Jesus to an evanescent summary of historiographic hypotheses. On the contrary, it is necessary to open oneself - in an attitude of humble listening - to God who interpellates us in all Creation and who, above all, showed us his face in Jesus. Even today, Christianity must show itself to be a proposal for a good and authentic life, as the best opportunity offered to man to find hope, happiness and joy. That is why the theology of Ratzinger-Benedict XVI is deeply concerned with the great ethical and historical problems of our time. His analyses of relativism and its 'dictatorship', which threatens to dry up the vital lymph of European civilization, and on the other hand, his commitment to propose in appropriate and relevant terms the actual context of the great moral and cultural heritage that comes to us from our history, represent an extraordinarily relevant contribution offered not only to the believer, but to whoever wishes to face responsibly the challenges which are before us. 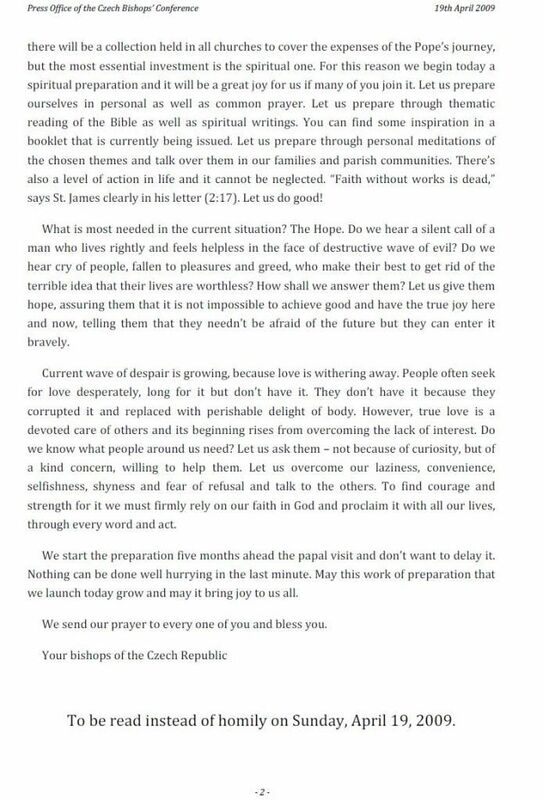 How evocative and fecund in this respect is the proposal formulated by Cardinal Ratzinger in a lecture in Subiaco on the eve of John Paul II's death. He called on those who cannot seem to believe to "live as if God exists': "In this way, no one will be limited in his freedom, and all our affairs will find a support and a standard that they urgently need". 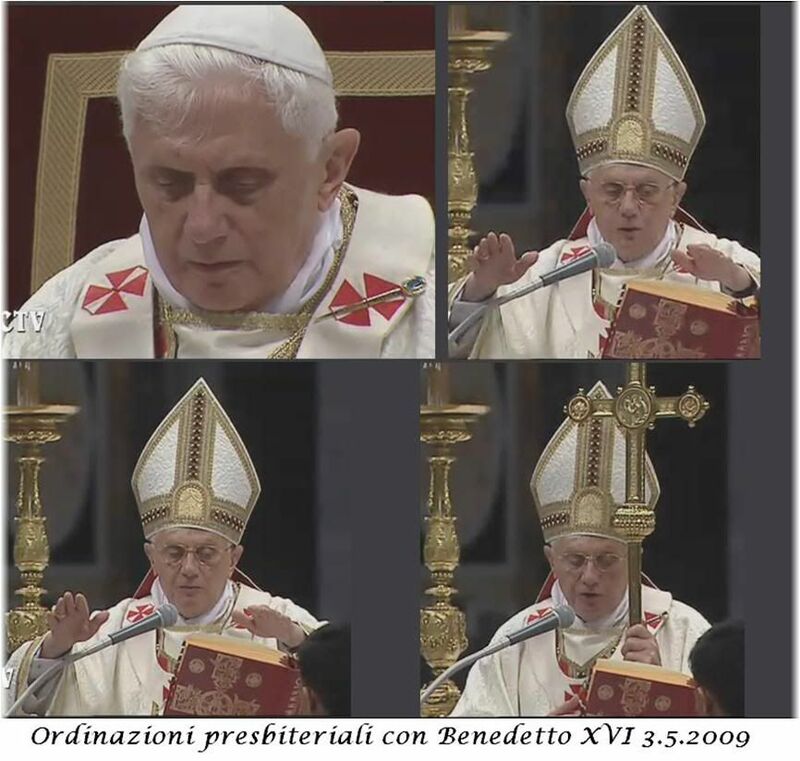 We have seen how liturgy was always for Benedict XVI the central activity of his life and the center of his theological work. Thus, even in dealing with ethical and historical problems, he never indulges in moralism which would entrust the task of overcoming these difficulties principally to the moral effort of the individual adn of teh collectivity. God's freely given action is always decisive - the presence in our lives of his love and his mercy. That is why prayer - particularly liturgical prayer in which the Church joins Christ to pray and praise God, remains the greatest resource which, even today, mankind can have at his disposal. I am so glad someone authoritative has come out with this, about a subject on which I have so far soft-pedalled my own comments (mostly incidental, when I am summarizing the OR's front-page stories), because L'Osservatore Romano, after all, is supposed to be 'the Pope's newspaper'. And it is obvious why I did not bother to translate a naive and often uninformed or misinformed view of Washington politics. - and he has enlisted dissenting Catholics such as Kathleen Sebelius to serve as his agents of moral destruction. At the very moment orthodox Catholics in America are reeling from Notre Dame's honoring of Obama, they wake up to find this editorial softpedaling his record. Et tu, L'Osservatore Romano? *(The)asterisk was for this: I don't understand that this 'analyst' for the Pope's own newspaper seems to shrug off Obama's decisions on funding abortion worldwide and embryonic stem-cell research, but then, OR reporting on Obama from the day he was elected has always been marked by a naive kind of 'idealism' that sees nothing but glowing good about Obama and his policies, making rash conclusions even on the basis of the most tentative hypotheses and statements by his administration - and not mentioning at all his dubious choice for Health Secretary in a woman whose toleration of abortion practices in her state was even more extreme than Obama's support of such practices in legislation. Why is the OR inching more and more towards the kind of politically correct, if not yet downright liberal, reading that the secular MSM already bury us under???? VATICAN CITY, May 1 (CNS) -- Pope Benedict XVI is set to begin a weeklong visit to the Holy Land, a pilgrimage in the footsteps of Christ and a journey through a political and interreligious minefield. In many ways, the May 8-15 visit to Jordan, Israel and the Palestinian territories is the most challenging of the Pope's foreign visits to date, one that will test his skills of communication and bridge-building in a region of conflict and mistrust. After recent communications missteps at the Vatican, the Pope can expect to find his every word and gesture under scrutiny by the world's media -- especially when it comes to relations among Christians, Muslims and Jews and the Israeli-Palestinian crisis. Although the world may measure the success of the visit in terms of international or interfaith diplomacy, Pope Benedict is going to the Holy Land first and foremost as a religious pilgrim. "The priority is to witness to the truth of the Incarnation by visiting, as head of the church, the places where the events of our redemption took place. That's the point," Franciscan Father David Jaeger, an Israeli priest and adviser to the Vatican, told Catholic News Service. The pilgrimage has a special focus on peace. The Pope, in announcing the visit, said he would be going to the Holy Land to pray for "the precious gift of unity and peace for the Middle East and all humanity." Father Jaeger said that's extremely important at a time when hopes for peace among the population are the lowest in many years. "The worst thing that can happen is the loss of hope for peace. So for him to speak openly of the possibility and the necessity of peace and reconciliation should thrust those values into the fore," Father Jaeger said. "It's not a political negotiation of course; he's not going to produce a peace treaty or try to. But the fact that he keeps the value of peace in front of the people of the region, that will be a tremendous contribution by the Church," he said. The first leg of the Pope's trip will take him to Jordan for a series of carefully chosen liturgies and encounters, including a visit to a mosque in Amman. That event, and the fact that Pope Benedict is spending several days in Jordan, reflects his aim to reach a wide Muslim audience. In 2006, Pope Benedict prayed in a mosque in Turkey, a gesture that spoke volumes to the Islamic world. In Amman, the Pope will deliver a speech outside the mosque to Muslim leaders, diplomats and rectors of the University of Jordan. The audience and the setting make it likely that the pope will revisit the themes of his speech in 2006 in Regensburg, Germany, but this time making sure his remarks on reason and faith do not unintentionally offend his listeners. For Jordan's Catholic faithful, who number about 75,000 in a population of 6.2 million, the big event will be the papal Mass in an Amman soccer stadium May 10. Two smaller papal events in Jordan should not go unnoticed. His first appointment in Amman is at the Regina Pacis center, a special needs facility that has inspired Christian-Muslim dialogue and collaboration. Here the Pope is likely to emphasize the importance of the "dialogue of life" and social cooperation among followers of the Abrahamic faiths. The Pope also will lay the cornerstone of the University of Madaba, which is being built by the Latin patriarchate; blessing cornerstones is a common activity in papal visits, but establishing a Catholic-run university in a predominantly Muslim country makes this one special. Much of the Pope's itinerary follows in the footsteps of Pope John Paul II's Holy Land pilgrimage in 2000. Pope Benedict, for example, will pray at Mount Nebo in western Jordan, where Moses glimpsed the Promised Land before dying. And, like his predecessor, he will visit the Jordan River where Jesus was baptized -- the setting of the opening chapter of Pope Benedict's book, Jesus of Nazareth. The Pope travels to Jerusalem May 11 and later that day visits the Yad Vashem Holocaust memorial, in what Vatican aides view as a central event of the trip. When Pope John Paul spoke at the memorial in 2000, Israelis reacted with warm appreciation; many considered it a turning point in his pilgrimage. Pope Benedict has spoken eloquently about the Holocaust, and as a German has recalled growing up as a witness to the brutality of the regime that targeted Jews for extermination. Vatican sources said, however, that the Pope will not be going to Yad Vashem to apologize as a German, but to invoke a wider lesson on the dangers of racism and anti-Semitism. On May 12, his first full day in Jerusalem, the Pope visits sites sacred to Islam, Judaism and Christianity. He begins at the Dome of the Rock, one of Islam's holiest shrines, and proceeds to the Western Wall, sacred to Jews. The two sites lie adjacent to each other and in the past have been the scene of bitter skirmishes between Palestinians and Israelis. The same day the Pope will meet separately with the city's two chief rabbis and the grand mufti. The Pope will make a daylong visit May 13 to the West Bank city of Bethlehem, the birthplace of Jesus, and today a key administrative city of the Palestinian Authority, whose officials will welcome the pontiff at the presidential palace. The main religious event of the day is a Mass in Manger Square. That afternoon, the Pope will visit the Aida Refugee Camp, where some 5,000 Palestinians live. The visit is already politically charged. Latin Patriarch Fouad Twal of Jerusalem said recently that the camp, which has a giant key installed atop one of the camp's gates, symbolizes the "right to return," the principle that Palestinian refugees have a right to return to the homes in Israel that they have been forced to leave at various times since 1946, when the war for Israeli statehood began. In addition, Israel has objected that the platform being built to host the Aida event is too close to the Israeli separation wall, which Israel has designed as a 400-mile-long security barrier through the West Bank and which Palestinians see as an instrument of repression. The Pope will celebrate Mass May 14 in Nazareth, the city where Jesus grew up, and later visit the Grotto of the Annunciation and hold a prayer service with Catholic leaders of Galilee. Like his Mass earlier in the week in the Josafat Valley near the Garden of Gethsemane, these liturgies are central to the Pope's pilgrimage, offering moral support to the dwindling Christian population in the land where the church was born. U.S. Cardinal John P. Foley, grand master of the Equestrian Order of the Holy Sepulcher of Jerusalem, said the Pope's visit would underline the importance of maintaining the Christian presence in the Holy Land. "He will do what Peter always does: encourage the faithful, recognize them, give them a renewed sense of worth and let them know how much the universal church appreciates them and the importance of their faith," the cardinal said. VATICAN CITY, May 1 (CNS) -- A leading Jewish rabbi said Pope Benedict XVI's Holy Land visit was certain to consolidate the historic reconciliation process between Catholics and Jews. The Pope's May 8-15 trip, which includes five days in Jerusalem, will demonstrate the Vatican's respect for the state of Israel as part of Jewish identity, said Rabbi David Rosen, director of interreligious affairs for the American Jewish Committee. Rabbi Rosen made the comments in an article in the April 29 English-language edition of the Vatican newspaper, L'Osservatore Romano. "In visiting Israel and demonstrating the Holy See's respect for the Jewish state, reinforcing the impact of the pioneering visit of his predecessor, Pope Benedict XVI will undoubtedly further advance the historical process of Catholic-Jewish reconciliation," Rabbi Rosen wrote. 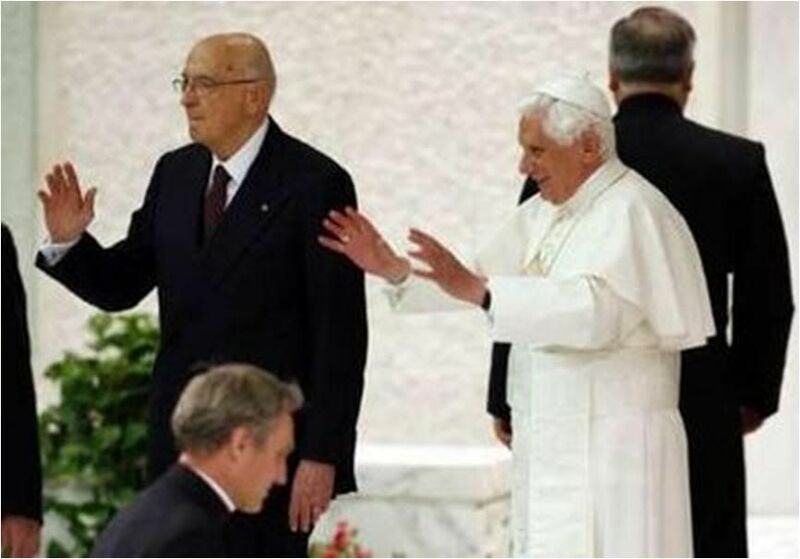 "Pope Benedict XVI will be walking in the footsteps of his great predecessor both literally and figuratively. Pope John Paul II -- very much the hero of Catholic-Jewish reconciliation in our times -- understood full well that the visit of a Pope to Israel has a special significance of its own," he said. Rabbi Rosen said that even if the visit of Pope John Paul in 2000 was described as a pilgrimage "it was still a state visit with all the relevant trappings" and recognized the essential relationship between the Jewish people and the land of Israel. Pope Benedict, too, will be demonstrating more than good will to the 6 million Jews who reside in the Holy Land today, he said. The rabbi said a papal visit can give wider expression to some of the principles and values familiar to dialogue experts. "Most Israeli Jews and especially the more traditional and observant among them have never met a modern Christian," he said. But when they saw Pope John Paul visit the Yad Vashem Holocaust memorial and the Western Wall and heard what he had to say, they realized the head of the Catholic Church was a "sincere friend," he said. Pope Benedict will visit the Holocaust memorial and pray at the Western Wall, and will meet with the two chief rabbis of Jerusalem during his visit. Rabbi Rosen also noted that papal visits can give rise to concrete initiatives. 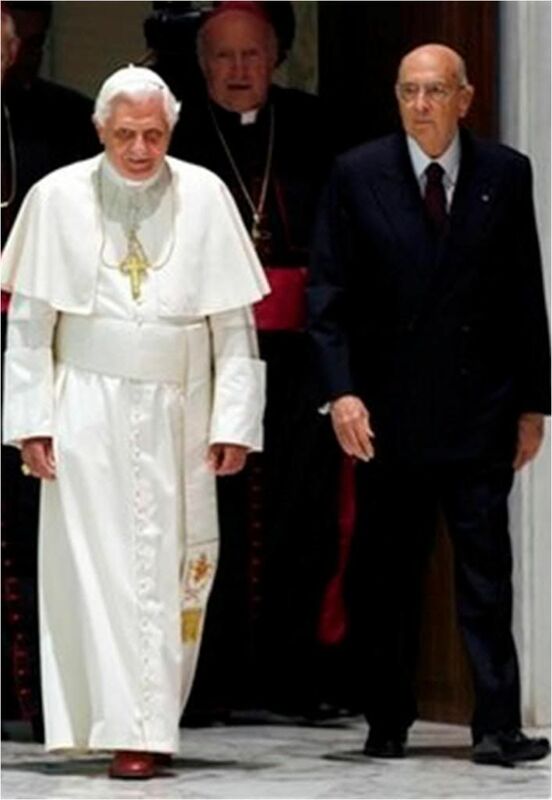 During his visit in 2000, Pope John Paul proposed establishing a new dialogue commission between the Vatican and the Chief Rabbinate of Israel. That commission's work over the last eight years has led to a relationship of genuine appreciation and friendship, and has affected the attitudes of people inside Israel, Rabbi Rosen said. Rosen's article, which I remarked on in my caption summary for the 4/29/09 OR in the PRF, is the first article by a rabbi published by the OR. I meant to translate it for that reason and because it has to do with the Pope's coming trip, but it was one of those things I ended up not having time to do - I hope I still can. Pope Benedict XVI and President Shimon Peres will inaugurate a new tradition when the Pope arrives in Israel in two weeks: They will plant an olive tree in a stretch of ground on the Beit Hanassi complex that has been designated as a peace garden. All world leaders visiting Beit Hanassi in the future will be asked to add their olive trees to the peace garden so that world peace will symbolically take root. Despite attempts in some quarters to envelop the papal visit in political connotations, Benedict XVI is coming to the Holy Land under the banner of peace with goodwill toward all faiths and all nations. It is in this spirit that he will be greeted at Beit Hanassi by two children, one Christian and one Jewish, from Nazareth and Upper Nazareth who will welcome him to the land of milk and honey and present him with a basket of fruits containing the seven species. The basket will also contain new fruits and grains developed in the Arava and in the Volcani Institute, and one of them will be named after the Pope. Other gifts the Pope will receive at Beit Hanassi include a nanochip the size of a grain of rice containing the whole of the Bible, and a specially commissioned Menashe Kadishman painting. Kadishman, one of Israel's foremost artists, is famous for his paintings of sheep. This painting will feature a shepherd, as the pope is considered the shepherd of his Catholic flock and is widely respected by other streams of Christianity. Aside from a gala red carpet welcome, the Pope will be greeted by some 800 people, including Voices of Peace, a 50-member children's choir of Jewish, Christian and Muslim singers from Jaffa; righteous gentiles living in Israel; Holocaust survivors; bereaved families; representatives of the Negev and the Galilee; Nobel Prize laureates; leading academics; leaders of Jerusalem's three major faiths; and various dignitaries. Special prayers for peace will be recited by Jewish, Christian and Muslim spiritual leaders. Peres and the Pope will have a working meeting and will address the gathering before leaving for Yad Vashem. 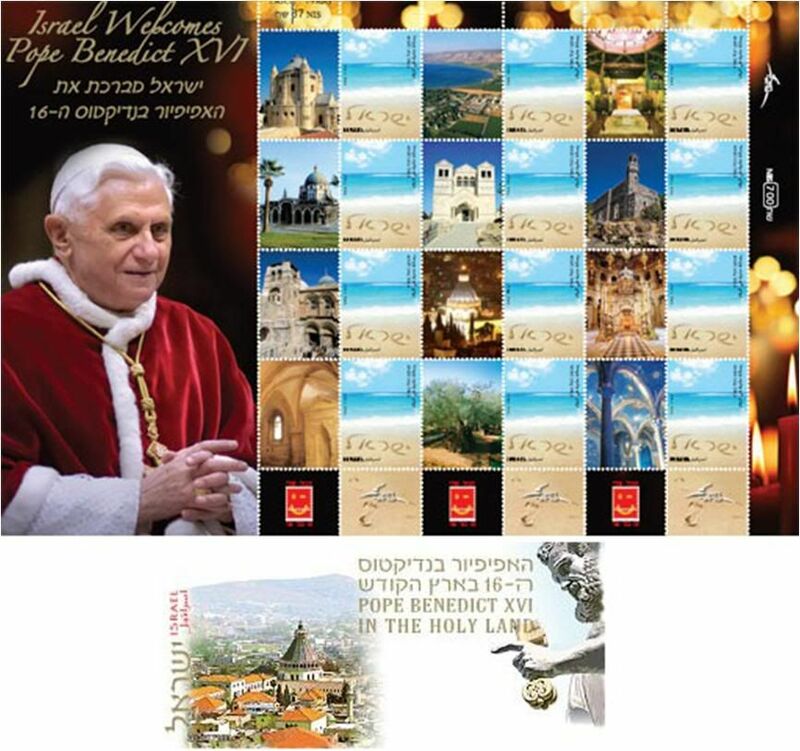 The Israeli Postal Authority is launching a special stamp series in honor of Pope Benedict XVI's upcoming visit,featuring churches across the country. The Pontiff is due to arrive in Israel on May 11 for a four-day stay, which will include visits to the Palestinian Authority and the Church of the Nativity in Bethlehem. The stamp issue is not just out of good will, of course. The comments on the Haaretz page that carried this item more or less said, "Go to it! Make money out of all those Christian stamp collectors around the world who will not want to miss this!" 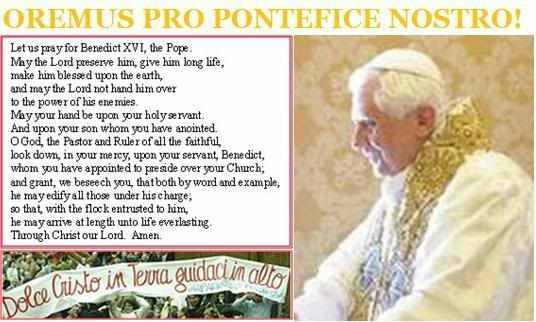 ROME, May 1 (CNS) -- Incessant and unwarranted criticism against Pope Benedict XVI is part of a larger anti-Church campaign being waged by major newspapers and media outlets in the United States and Europe, said an Italian Jesuit magazine. "Catholics in Italy and Europe know very well that a preconceived hostility exists against church doctrine, especially in the field of ethics," La Civilta Cattolica said. The mass media, "which is the voice of powerful forces and interests, is an excellent propagator of this hostility," said a May 2 article released to journalists April 30. The article, written by Jesuit Father Giandomenico Mucci, said "the media campaign that tends to discredit the Pope finds fodder in the most outrageous interpretations made from papal speeches" and remarks. The Rome-based biweekly magazine is reviewed by the Vatican Secretariat of State before publication. The magazine said there have been numerous occasions when commentators have distorted what the Pope says or does because they view his actions through "biased lenses." Pope Benedict and his teachings have been the target of a constant barrage of "over-criticism, aggravation and unpleasantness," it said. Even when the Pope was Cardinal Joseph Ratzinger, head of the Congregation for the Doctrine of the Faith under Pope John Paul II, he was described as Pope John Paul's German Rottweiler -- an "inflexible, cold controller of doctrine," it said. Instead, anyone who has actually met or knows Pope Benedict would know that he has always been esteemed, even when he was head of the doctrinal office, for being an extremely gentle, spiritual, intellectually curious and peaceful man, said the article. These "denigrating and delegitimizing efforts" against the Pope, it said, are part of a "much larger campaign, which, at a universal level, tends to discredit the Catholic Church: from the (London) Times to The New York Times and The Washington Post, from Le Monde ... to the Italian press." While not citing specific press reports, the magazine said the secular press often has put in a negative light Church pronouncements on the sacredness of human life from conception to natural death, and Church opposition to the legal recognition of civil unions. The reason for this hostility, said the journal, is people are opposed to religion in general and Catholicism in particular for asserting itself as the keeper of the one absolute truth. Dogma, rules and morality that are not self-made make the church and the Pope "inconvenient" for people caught up in the secular world and its false sense of freedom, it said. But the critics are not in the majority [Yes, they are, in the MSM - but I hope not among all the 'simple faithful' like me! ], it said, and many people admire and praise the Pope and the Church for proclaiming "a new humanism." The Church offers humanity "an ethical project that focuses on forming the person in his or her entirety; it is a clear and solid spiritual and cultural project inspired by doctrine and indulgent toward the stumblings of every single individual," it said. Sometimes, I have to pinch myself when I come on reports like this from any Jesuit outlet, even La Civilta Cattolica. I have become so 'inoculated' over the decades by exposure to Jesuit progressivism that falls just a little bit shy of full-blown liberation theology that any time I see a Jesuit writing sensibly from an orthodox Catholic viewpoint, I almost have to fall on my knees in thanksgiving to the Lord. I must say that in the past four years, I have discovered a handful of Jesuits whom I have learned to admire greatly for the impressive ways in which they write about their orthodox views (Fathers Schall, Fessio, Samir, Troll, Baker, and the late Cardinal Dulles, God bless his soul!). But think, for instance, of the 'new' Jesuit Superior-General who wears his bleeding liberal heart on his sleeve, the Jesuits of America and Commonweal, the Jesuit theologians who question Christ's divinity, Thomas Reese and that ex-Vatican functionary who hosted a terrorist web Q&A right after the Regensburg lecture - with their open defiance and disobedience to the Pope (though in varying degrees) - one must wonder what St. Ignatius would say to them if he were alive today. I expect Sandro Magister will make the Civilta article available in full soon. 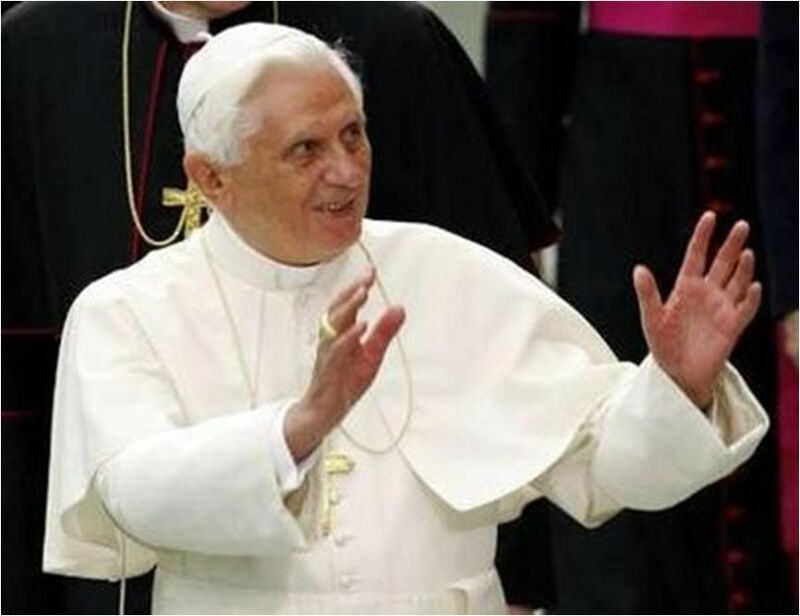 Madrid, Spain, Apr 30, 2009 (CNA).- A Spanish congressional committee has approved a proposal by green party lawmakers to “publicly” reprove the statements made by Pope Benedict XVI about AIDS and condom use during his recent trip to Africa. The measure moved through committee despite a lack of support from the more conservative Popular Party. The vote against the measure by Popular Party members was the second time in a week they have voted against leftist proposals. Last Tuesday, they voted against a proposal to hold hearings on sexual health in Africa and Latin America, although the proposal was adopted. The denouncements being made against the Pope continue to occur despite scientific evidence that the Pope's statement was correct. I came across this just now while trolling around for items on the Papal trip to the Holy Land - and I was just as excited at the interview itself as by the tiny photo it came with, showing Rabbi Neusner with the Pope in Washington, DC last year. In an interview for a major European periodical that will appear next week, Professor Jacob Neusner comments on the Pope's trip to Israel. Here is a preview of his views with our thanks to Professor Neusner for sharing this perceptive interview with us. Why is the Pope's trip to Holy Land important from your perspective? What are the stakes? The Pope is a moral authority for the Catholic faithful and for humanity at large. The long-standing conflict between the state of Israel and the Arab neighbors represents an opportunity to exercise the moral authority that the world imputes to the Pope. How could you describe the political context of the trip after the Gaza crisis last January? It is a difficult mission, because Hamas refuses to negotiate peace with the state of Israel. The two-state solution is endangered by Hamas intransigence, and no other resolution of the conflict presents itself. What is your main expectation? Pope Benedict XVI has shown the capacity to speak bluntly to the world at large, as his address at Regensburg last year showed. He does not dissimulate or mince words. I expect that he will speak truth to all parties and preserve a balanced and just position for all concerned. That is his record. At the same time the Roman Catholic Church has its interests in the Middle East, which will be on the Pope's mind. The Moslem countries do not accord to Christianity the rights of free expression that they demand and get from the Christian countries. The Pope is likely to pursue that matter too. In what sense would this trip be a failure? In what sense would this trip be a success? If both parties are helped to find steps toward the path to peace in response to the Pope's presence, that will mark success. How could you describe the symbolic context of this trip after the Williamson polemic or the Pio XII beatification polemic? What is your main expectation relating to latent anti-Semitism? As to Pius XII, until the archives have been studied by all interested parties no determination on the facts of the matter can be reached. The Catholic Church has a long record of anti-Semitism, as shown by Jules Isaac The Teaching of Contemmpt, but from Pope John XXIII onward a record of respect for Judaism and friendship for the Jewish People has taken shape. That does not mean that old habits of thought have been everywhere abandoned, only that there are now competing views. Pope Benedict XVI has repeatedly shown himself part of the tradition begun by John XXIII and John Paul II. He wants to be - and to be known as - a friend of the Jewish people. Does the fact that this Pope is German change anything or give more importance to the trip? The Pope has taken pride in his German heritage and, given the record of Germany since 1945 in repudiating its shameful past and its policy of reparation and conciliation with the Jewish People and its consistent support for the state of Israel, there is much in which to take pride. He has shown sensitivity toward Jewish concerns and has corrected and acknowledged errors when they were made. Above all this trip is a pilgrimage. How do you see it, as rabbi and Jewish intellectual? When a century ago Theodor Herzl, founder of Zionism, turned to the Pope for support for a Jewish state, he was told that until the Jewish people converted to Christianity, the Church would do nothing to establish a Jewish state. Papal visits to the state of Israel - this is not the first and will not be the last - repudiate that original decision and affirm the legitimacy of Israel as the Jewish state. It is always important to recognize the implicit statement represented by the Pope's pilgrimage. What is the main stake from an inter-religious perspective? The relationship between Judaism and Christianity in the aftermath of Vatican II has defined the task of reconciliation and this visit represents a step toward the realization of amity between the two religions. Could this trip be a new step in Jewish-Christian reconciliation or will there always be tensions? This is not a new step, John Paul II took the new step, but in that tradition this is a step forward, beyond tensions. Do you think that this Pope, as a theologian, has a special responsibility in this matter? Pope Benedict XVI represents the tradition embodied by John Paul II and has taken it as his special responsibility to nurture that new tradition of friendship with the Jewish people and the state of Israel. How do you assess the importance of his theological work on Catholic-Jewish relationships? 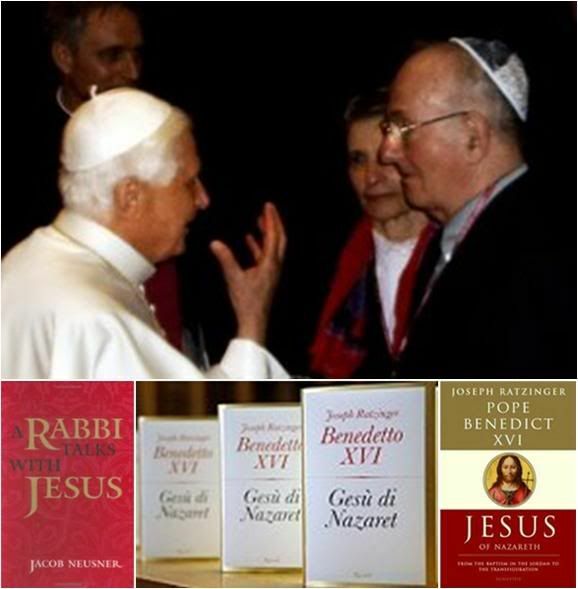 The ideas that Benedict XVI put forth in his writings mark him as an important figure in the Catholic-Jewish dialogue, he is a great scholar and philosopher and theologian - and the power of his ideas and critical thought will shape the mind of generations to come. Ideas matter and he is a man of great ideas. In his book 'Jesus' the Pope refers to your book and research about Jesus. Was that a surprise to you? Did you continue am intellectual dialogue with him? I am always happily surprised to find appreciation for my writing. Over the past decades Cardinal Ratzinger sent me articles he published aas well as his books, and I reciprocated. But JESUS OF NAZARETH stands by itself. 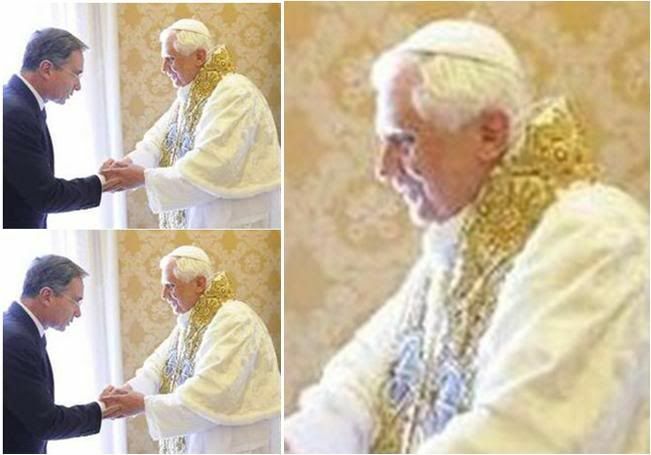 Who is Benedict XVI as you see him? Before President Bush met with the Pope two years ago I was asked to the White House to offer advice to the President on the man he was about to meet. I told him that I did not know Pope Benedict XVI personally, only through letters, but I had formed the impression of a man who embodied the European tradition of culture and intellect, that he is not only very astute but also civilized, a model of a religious intellectual. His papacy concerns itself with all corners of the world but it embodies the Catholic message to Western civilization. *I had a rather vivid account of that meeting between the Pope and the Rabbi from a New York rabbi who had witnessed the meeting and recounted what Rabbi Neusner told him about it. Also a red-letter day in my own life as I saw Benedict XVI for the first time, from fairly close, on two separate occasions that same afternoon. BTW, I checked out some of the entries from the blog that yielded this preview, and found to my horror that the blogger is a stereotype Pope-hater - his topic list shows 81 entries so far for the Pope and the most recent two (not including this, which he ran because he happens to be an ardent supporter of Rabbi Neusner - he seels his books on a related booksite) were horrendous! He reminds me of every Jewish intellectual snob - men and especially women - who seem to typify the garden variety that thrives in the Upper West Side of New York where I live. No OR today, since May 1 was a religious holiday. - Members of the Papal Foundation. Address in English. in Bangkok on May 10-11.
of the seminaries concerned, and the parish priests of the ordinands. 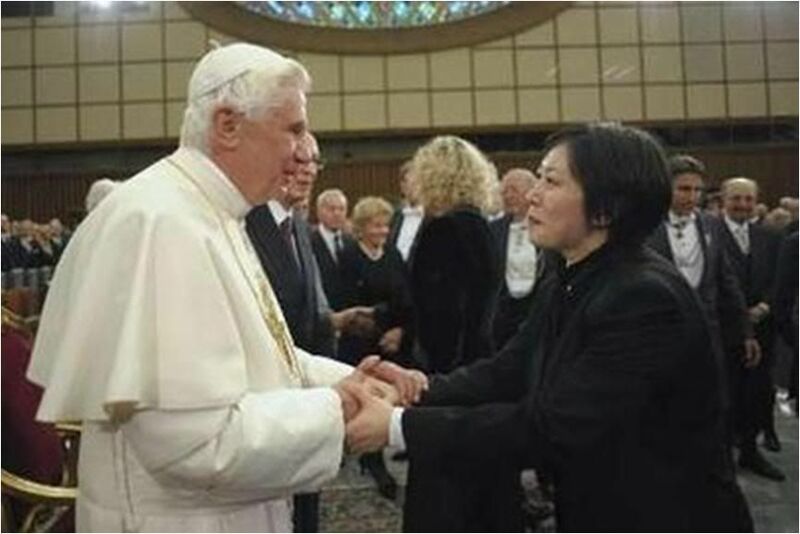 Tel Aviv, May 1 (AsiaNews) – The Holy See and the State of Israel have made significant progress but the long-awaited economic and tax agreement between the Catholic Church and Israel will not be signed before the visit of Benedict XVI to the Holy Land. The Bilateral Permanent Working Commission between the Holy See and the State of Israel met yesterday in plenary session at Israel's Ministry of Foreign Affairs. The delegations were headed, respectively, by Mgr Pietro Parolin, the Holy See's under-secretary for Relations with States, and Mr. Danny Ayalon, the deputy foreign minister of the Government of Israel. After a half day of talks the two delegations released a joint communiqué in which they noted that “significant progress” had been made by working-level negotiators in the months since the previous plenary in December of last year, and announced that the next plenary is scheduled to take place on 10 December this year, at the Vatican. Some in the media had been expecting the Bilateral Commission to complete its work on the ‘Economic Agreement’ in time for the Holy Father's pilgrimage to the Holy Land (8-15 May), although experts had been warning that that was not a realistic expectation. The announcement of the next plenary for December means that negotiations are expected to last at least until then. At the same time the delegations repeated their commitment to accelerate the negotiations in order to reach agreement as soon as possible. - Obtain the return to the Church of some lost properties, particularly sacred places, such as the church-shrine in Caesarea that was expropriated and razed to the ground in the 1950's. These negotiations began on 11 March 1999. One would think that in 11 years of twice-yearly meetings, something should have moced by now. For instance, rules for the protection of Church property should not be a matter of dispute. The two other main poibnts on the agenda - Church tax exemptions and return of confiscated Church property - both involve financial considerations. The state of Israel claims the Church owes tens of millions in back taxes, which religious institutions are exempt from, as a rule, in all democratic states; and presumably, the return of 'lost' property would involve restitution as well for whatever buildings (including centuries-old historic ones) may have been demolished by the Israelis as they put Church property to their own secular uses. One particular issue that might have been the concession par excellence to start off the Holy Father's pilgrimage is that of control over the Cenacle - the room where the Last Supper was held - which is located in a building Jews believe was built over the tomb of King David and is, of course, one of the most important Jewish shrines (even if this location, according to tradition, does not gibe with the Hebrew Bible's account that indicates David was buried in Ophel (a place in Jerusalem known as 'the city of David') along with other Judean kings. I haven't had time to research this except for the bare facts but if the Cenacle was located over the site of David's tomb, surely that was a fact significant enough to be mentioned in the Gospels! The Bilateral Permanent Working Commission between the Holy See and the State of Israel has held a Plenary meeting at the Ministry of Foreign Affairs of the State of Israel today, Thursday 30 April 2009, for the purpose of advancing the negotiations pursuant to Article 10 § 2 of the Fundamental Agreement between the Holy See and the State of Israel (30 December 1993). - Father Giovanni Caputa, SDB, Secretary. - Ms. Idit Duvdevany, Legal Division, MFA. The Plenary meeting of the Commission took place in an atmosphere of great friendship and a spirit of cooperation and good will. The Plenary noted that the Working Level Commission achieved significant progress, on the eve of the upcoming important visit of the Pope in Jerusalem. 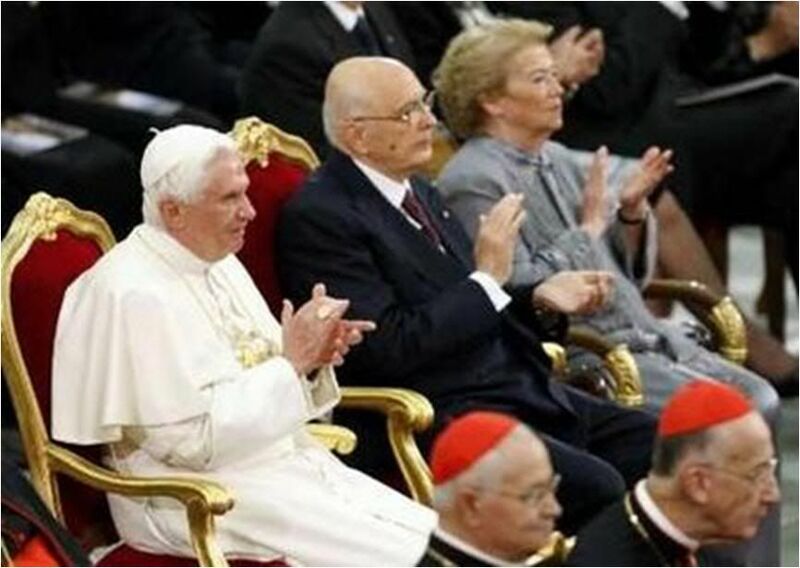 It was agreed to hold the next Plenary meeting on 10 December 2009, at the Vatican. In the meantime, the working-level Commission will hold meetings in furtherance of both Delegations’ pledge to accelerate the talks and conclude the Agreement at the earliest opportunity. The Cenacle today is unmistakably Gothic, having been built by the Crusaders in the 13th century as part of a church, St. Mary of Zion, over what was believed to have been the historic site on Mt. Zion. It is located on the second floor of a fairly nondescript stone building which is a 16th century reconstruction by the Franciscans, only to yield it to the Ottomans not long after, so that Muslims had control until after the Second World War. During that time the Cenacle was used as a mosque. The site now known as David's Tomb (right photo)) is on the ground floor and except for the velvet covering draped over it with the appropriate Hebrew symbols, is otherwise found inside a stark and unadorned stone chamber. The day I visited was a rainy day and visitors had to walk through a partly flooded hallway over an improvised ramp to get to the chamber with the tomb. There were no guards and no other personnel around except for the man at the entrance, and no need for a ticket or an admission fee, as I recall. Tradition has conflated the Cenacle into both the room of the Last Supper, as well as the room where the Holy Spirit came to Mary and the Apostles on the first Pentecost. The Holy Father met today with trustees and representatives of the US-based Papal Foundation, and asked them to pray for his coming pilgrimage to the Holy Land. The Papal Foundation solicits contributions from the faithful and invests the funds in order to support the Pope's missionary and charitableprojects around the world, whether missionary, charitable and ecclesiastical projects around the world, including many in the Holy Land. It is a great pleasure for me to have the opportunity to greet the members of the Papal Foundation once again, on your annual visit to Rome. In this Pauline Year I welcome you with the words of the Apostle of the Gentiles, "Grace to you and peace from God our Father and the Lord Jesus Christ" (Rom 1:7). Saint Paul reminds us of how the entire human race yearns for God’s grace of peace. Today’s world is truly in need of his peace, especially as it faces the tragedies of war, division, poverty and despair. In just a few days I will have the privilege of visiting the Holy Land. I go as a pilgrim of peace. As you are well aware, for more than sixty years, this region — the land of our Lord’s birth, death and Resurrection; a sacred place for the world’s three great monotheistic religions — has been plagued by violence and injustice. This has led to a general atmosphere of mistrust, uncertainty and fear – often pitting neighbor against neighbor, brother against brother. As I prepare for this significant journey I ask in a special way that you join me in prayer for all the peoples of the Holy Land and the region. May they receive the gifts of reconciliation, hope and peace. Our meeting this year occurs during a time when the entire world is struggling with a very worrying economic situation. At moments such as these it is tempting to overlook those without a voice and think only of our own difficulties. As Christians we are aware, however, that especially when times are difficult we must work even harder to ensure that the consoling message of our Lord is heard. Rather than turning in on ourselves, we must continue to be beacons of hope, strength and support for others, most especially those who have no one to watch over or assist them. For this reason I am pleased to have you here today. You are examples of good Christian men and women who continue to meet the challenges we face with courage and trust. Indeed, the Papal Foundation itself, through the great generosity of many, enables valuable assistance to be carried out in the name of Christ and his Church. For your sacrifice and dedication I am most grateful to you: by means of your support the Easter message of joy, hope, reconciliation and peace is more widely proclaimed. Entrusting all of you to the loving intercession of the Blessed Virgin Mary, she who remains always in our midst as our Mother, the Mother of Hope, (cf. Spe Salvi, 50), I cordially impart my Apostolic Blessing to you and your families as a pledge of joy and peace in the Risen Savior. Someone recently sent me an on-line account of Christopher Buckley's reflections on his parents' deaths within a year of each other in 2007 and 2008. The passage is from the author's new book on his famous father, the late William F. Buckley, Jr. In many ways, it is a touching, even at times humorous, account. In the course of his comments on life, death, and religion, as an aside, the younger Buckley informs us that he no longer believes in the fact of the Resurrection of Christ. I presume that he once did, but now does not. This information is not presented as an argument but as autobiography about himself, as if we would care to know his theology in the face of the death of his parents. Lots of folks, of course, do not believe in the existence or Resurrection of Christ. More credibility is usually given to those who once did believe in this fact but now have "wised up" and do not. We can find others, no doubt, who did not believe in the Resurrection but who now do. The Apostles themselves practically needed clobbering over the head to accept it — a rather consoling fact, I have often thought. We have always to be grateful to the Apostle Thomas, the famous doubting Thomas, for his skepticism about the Resurrection — "Blessed are those, Thomas, who have not seen but who have believed." If one is a Muslim or a Jew, he cannot believe in this fact and remain what he is. Hindus seem to allow for many resurrections of various sorts. And, if one is a Buddhist, it is hard to see into what Christ would have been subsumed. I have met few atheists who hold this doctrine. Lots of people will acknowledge it — provided it does not mean what it says it does. Still others will take it on "pure" faith. This means that no suasive grounds in reason exist that would also make it plausible. Anyone who doubts his own existence or who doesn't think he can get outside his own mind will, admittedly, have a tough time with this doctrine. This will be especially true if he thinks that Christ shared his own philosophic view of reality. In the history of Christianity itself, this doctrine, from the very first, has had a stormy career. Many have managed so to mitigate or even deny it that it ironically seems possible to be a "Christian" and skip this doctrine, in spite of Paul's famous words to the contrary that without it our faith is "in vain." Some theories say that Christ did not really rise again, but the Apostles so wanted it to happen that they imagined that it did. The fact that the Apostles themselves were quite surprised by the event seems to be overlooked. Explanations of the "empty tomb" on Easter morn abound. The only reason for the emptiness that is not admitted is the one that says that in fact Christ rose again, as He said he would. The early Jews said the body was "stolen" in spite of the guard put there to prevent this very absconding by the disciples. Many psychological theories concoct dream or illusion theories to account for the phenomenon. For some odd reason, mankind has worked very hard to deny that there is evidence or logic in this event. We find what can only be called a vested interest in its not having happened. The reason for this insistence that it did not happen seems more moral than scientific or metaphysical. For if it did, but we deny it, as some wit used to say, "There'd be hell to pay." The New Testament actually gives the impression that what we hold and believe also has something to do with our personal destiny as related to how we choose to live. Catholicism is not indifferent to mind. It thinks events can be put into words that accurately state what happened. We can understand these words both in the here and now and over time. It thinks that witnesses can reliably tell us what they saw. Finally, it also thinks that, if this event did happen, the best way to make it known down the ages is for others to know that it happened probably in the way that it is reported to us, through the testimony of those who told us what they saw and who, often, died for its truth. Taking my cue from Chesterton's Heretics, I have always suspected that, when someone bothers to tell me that he "no longer believes in the Resurrection," that itself is probably a pretty good reason why it might just be true. We can detect a subtle relation between what we say we do or do not believe and how we live. Our minds protect our deeds, the ones we want to keep from harm's way. One of the reasons I like Pope Benedict is that he seems to have thought of just about everything long before he was ever elevated to the See of Peter, and so becoming Pope did not slow him down. This is a statement of political philosophy as well as of theology and metaphysics. Rational activity has a proper meaning. History is not enclosed by man alone. Politics is freed insofar as it is not itself a divine claim, a claim that it often makes implicitly for itself. 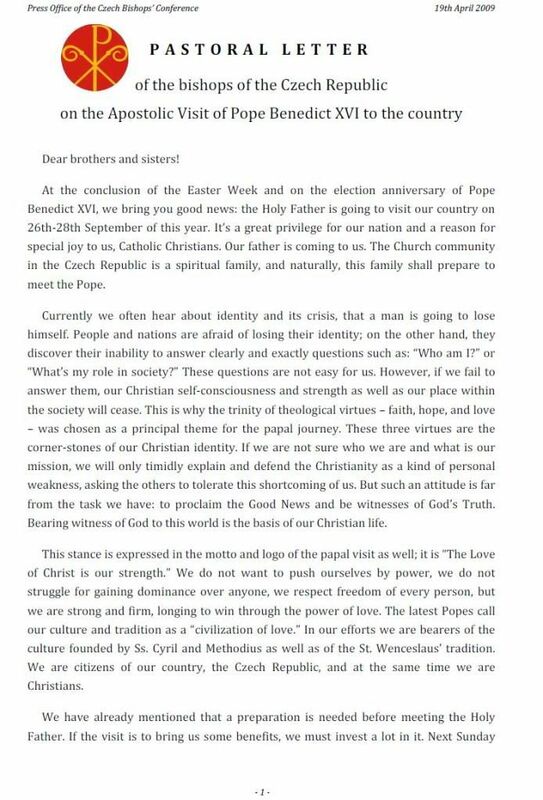 In this connection, the Holy Father's Easter Sermon was striking (L'Osservatore Romano, English, April 15, 2009). Death, Benedict affirmed, does not have "the last word." What follows is extraordinary: "Jesus is risen so that we too, believing in Him, may have eternal life. This proclamation is at the heart of the Gospel message." This truth is itself the judgment on those who have no faith in this event. In denying the resurrection we implicitly lock ourselves into this world, by choice. Following Paul, if we do not believe in the Resurrection, we are not to be praised, we are not to be boastful. We are to be "pitied." Something new began at Easter dawn. The meaning of hope is changed and grounded. Easter is not just "a moment in history, but the beginning of a new condition. Jesus is risen not because His memory remains alive in the hearts of His disciples, but because he himself lives in us, and in him we can already savour the joy of eternal life." Notice here Benedict corrects any notion that Christ is just a figment in the "memory" of the Apostles. The Resurrection is not just like other passing historical moments. It makes something, history itself, new. The following passage of Benedict, I think, is of enormous significance. He goes right down the line on the alternative "theories" about what is meant by the Resurrection. He allows no alternate understanding except the clear fact that it happened. The Resurrection, then, is not a theory, but a historical reality revealed by the man Jesus Christ by means of His 'Passover,' His 'passage,' that opened the 'new way' between heaven and earth. We need to look at that sentence again. The Resurrection is not a "theory." It is a reality of history. We may or may not accept the evidence, but we cannot deny that this is what the Church affirms about this event. Many would like the Church to become "modern" by denying the event. The Church remains ever new precisely by not denying it. It is neither a myth (some say it was), nor a dream (others say this), it is not a vision or a utopia, it is not a fairy tale, but it is a singular and unrepeatable event. The rejection of the "vision" hypothesis deals with the psychic theorists. The rejection of the "utopia" deals with the politicians, who have scourged society in the past century seeking to put the Kingdom of God on earth. The "fairy tale" deals with those who want to make it a nice myth. But this does not reject the "fairy tales" of C. S. Lewis or Tolkien. They in fact teach what is orthodox. Or as Chesterton and Tolkien put it, this is the one fairy tale that is true. The Resurrection is an "event" that took place at a definite time, a definite place, to a definite person, and witnessed by others with names. It will not happen again. History is not cyclical. Its happening once is to be "remembered." That is, it changed the meaning of human history, or better, brought it back to what it was intended to be, the locus of our entrance into the divinity as adopted Sons of God. The statement of the fact is clear: "Jesus of Nazareth, son of Mary, who at dusk on Friday was taken down from the Cross and buried, has victoriously left the tomb. In fact, at dawn on the first day after the Sabbath, Peter and John found the tomb empty. Mary Magdalene and the other women encounted the risen Jesus." However we choose to deny the evidence of the Resurrection so that we can comfortably live without it, we cannot avoid the forceful assertion that this Resurrection is what happened. This is a report, not a theory. This Pope is himself a philosopher of the first rank. He knows the literature and on what it is based. As he said in Spe Salvi, the primary philosophical ground for the truth of this doctrine is provided by a Marxist philosopher (Adorno) trying to figure out the logic of justice. Adorno could see that the Resurrection of the body has to be true, historically true; otherwise the world is indeed in vain. The Resurrection is "light." This light shines in the "darkest" regions of our hearts in the world. To what does Benedict refer here? This was, eerily, the very sense that I had while reading the Buckley account, especially about the Cross in the garden that was to contain his parents' remains. 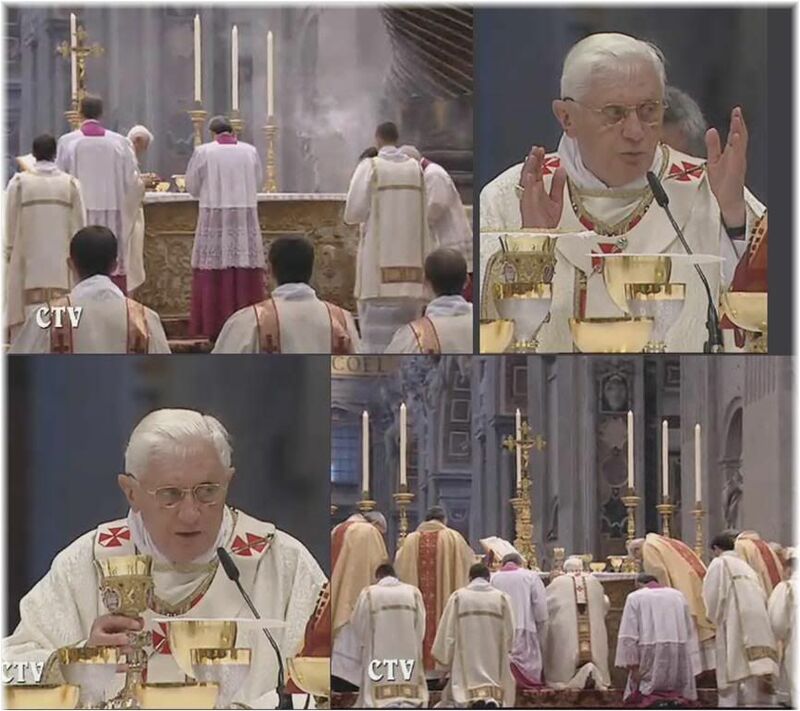 This emptiness, as Benedict says, is the logical alternative to eternal life and resurrection. It is indeed "cheerless." It leaves us empty. The destiny of human life is "nothing," "relative," it might be anything else but what it really is. It is a fact that if Christ had not risen, the 'emptiness' would be set to prevail. If we take away Christ and his Resurrection, there is no escape for man, and every one of his hopes remains an illusion. How straightforwardly does this Pope speak to us. The circle is closed without the light. The Pope says: "It is a fact." He does not mince words. Take away the Resurrection. Think logically and reasonably what follows. No real hope for each individual remains. And the corporate alternatives, the utopias, the political kingdoms, leave us as individual persons behind. They themselves turn into horrors because they are animated by a gnawing despair and a furious activism to avoid it. No escape exists for each of us to a destiny that includes precisely his individual person unless it is true that Christ has risen and told us that we are to follow Him. In his Regina Coeli comment on Easter Sunday, Benedict explained: "The divine plan of salvation, despite all the obscurity of history, will certainly be brought about." We must listen carefully to such direct words if we decide to "deny" the Resurrection. The plan will "certainly" be brought about. Each of us has the purpose of his creation in his soul. We are made for eternal life. It can be achieved because of this Resurrection. His Resurrection has formed a bridge between this world and eternal life over which every man and every woman can cross to reach the true end of our earthly pilgrimage. Notice that Benedict says of this "bridge" that each man and woman "can" cross over it to eternal life. This "can" implies that we can choose not to cross. We cannot choose not to be resurrected no matter how we live our lives. This will come about for all. But our lives and choices within our polities and our days will be the context in which we live this eternal life, either an eternal life of our own making or that of God's making. Such is our dignity. No one escapes the choice, no matter when or where he lives his four score years and ten, no matter whether he be Christian, Jew, Muslim, Buddhist, Hindu, atheist, or whatever. These too will pass away to rise again. We will be left with the Resurrection of the dead after the manner of Christ in the manner He described. But as Benedict often states, God cannot and will not take away our freedom to deny Him and His plan for us. He cannot save us if we do not want Him on His terms, not ours. I like the image of the "bridge between this world and eternal life." To cross a bridge, we have to choose first to cross it. There is no other way to the other side. Joseph Ratzinger, Eschatology: Death and Eternal Life (Washington: The Catholic University of America Press,  1988), 214. The German-born Pontiff leaves for the Middle East on May 8; he will spend three days in Jordan before flying to Israel. The trip is the first by a Pope to Israel since the 2000 pilgrimage by Benedict’s predecessor, Pope John Paul II. [Well, DUH! 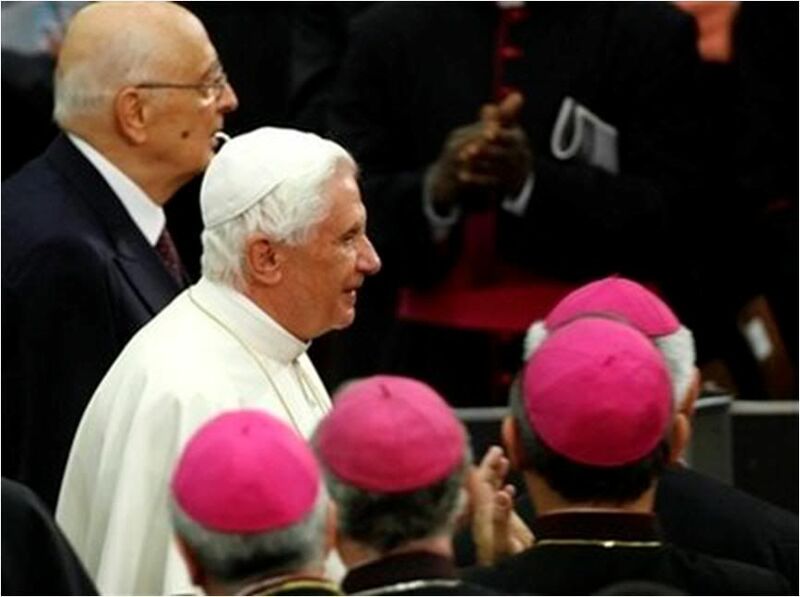 There's been no other Pope after John Paul II but Benedict!] John Paul was a historic trailblazer who made promoting Vatican-Jewish relations a central policy goal. 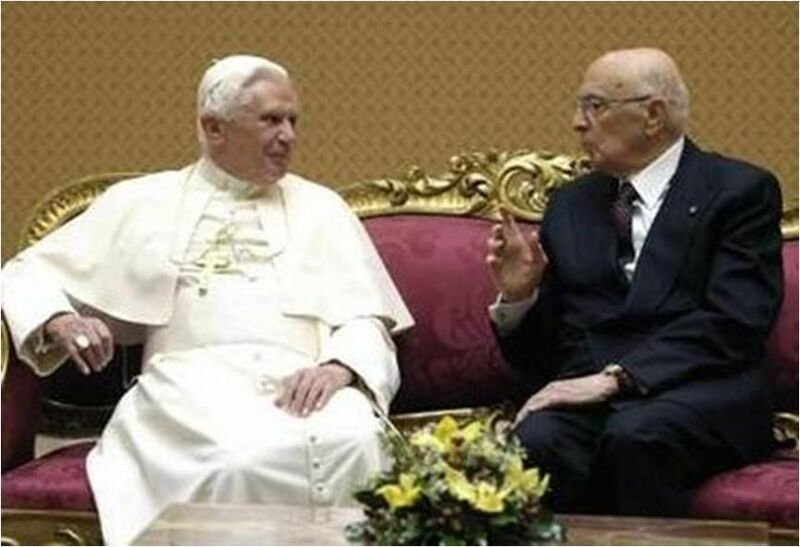 Inevitably, Benedict’s words and actions are sure to be compared — and contrasted — with John Paul’s. Several issues have strained Vatican-Jewish ties in recent months. In Rome, Lisa Palmieri-Billig, the American Jewish Committee’s liaison with the Vatican, told JTA that both sides were striving to minimize lingering problems ahead of the papal trip. On April 12, Benedict, 82, said he would “emphatically” bring a message of “justice and truth, mercy, forgiveness and love” on his trip. “Reconciliation — difficult but indispensable — is a precondition for a future of overall security and peaceful coexistence, and it can only be achieved through renewed, persevering and sincere efforts to resolve the Israeli-Palestinian conflict,“ he said. The Pope’s itinerary mixes prayer, politics and pastoral teaching to local Christians with an attempt to improve interfaith relations with both Muslims and Jews. It includes stops in Jerusalem, Bethlehem and Nazareth. There will be open-air Masses and meetings with Muslim and Jewish religious leaders. The Pope will visit the Yad Vashem Holocaust memorial and the al-Aida Palestinian refugee camp near Bethlehem. He will hold meetings with Israeli President Shimon Peres and Prime Minister Benjamin Netanyahu, as well as with Palestinian Authority President Mahmoud Abbas. Official Vatican policy is to maintain an equilibrium of sorts in its relations with Israel and the Arab world. “Its diplomacy is different from that of other states because it is always aware of the Christian populations,“ Palmieri-Billig said. In Jerusalem, Oded Ben-Hur, a former Israeli ambassador to the Vatican, said the Pope would be welcomed as a friend of Israel. The two states formalized full diplomatic relations in 1994. But years of fitful negotiations have failed to resolve several lingering issues, including fiscal status and tax issues regarding Church property in Israel and visa restrictions on Arab Christian priests. Meanwhile, Arab and Muslim sentiment ahead of the visit appears to be mixed. One possible problem could be the Pope’s last day in the region, May 15, which coincides with the day Palestinians commemorate as the Nakba — the “catastrophe” of Israel’s birth in May 1948. “The Pope’s Palestinian hosts will certainly ‘instrumentalize’ this,“ Avineri said. report on Israel’s Ynet news. Israeli media reports also said that officials were concerned that security and other infrastructure for the visit were not yet in place in the West Bank. Pamphlets in some Arab towns have called for protests against the Pope because of remarks he made in 2006 that were construed as insulting Islam. At the time, the remarks sparked protests in the West Bank and Gaza Strip, as well as elsewhere in the Arab world. “Everyone is crossing their fingers” that things go well, Avineri said. Let us all offer special prayers this month, that indeed, all goes well on the Pope's pilgrimage,and that his Christian wisdom will prevail over the multiple conflicting agendas of the factions that so clearly want to exploit his visit for their own purposes. 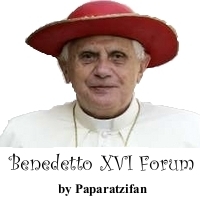 Benedict XVI's asks papal Foundation members to pray for his coming trip. NATO-Russia tensions increase despite resumption of formal relations; and the anti-Taliban offensive in Pakistan. Mass of Ordination for 19 new priests for the Diocese of Rome at St. Peter's Basilica. Homily [Translated - See following post]. Regina caeli. Message [Translated - See first post on the next page of this thread]. At 9:30 this morning, the fourth Sunday of Easter, the Holy Father presided at Mass in St. Peter's Basilica during which he ordained 19 new priests for the Diocese of Rome. Concelebrating were Cardinal Agostino Vallini, the Pope's Vicar-General for the Diocese of Rome; Mons. Luigi Moretti, Vice-Regent, along with the auxiliary bishops, superiors of the seminaries attended by the new priests, and their parish priests. Caterina's montage, as usual, gives a beautiful overview of the rites. Following a beautiful custom, the Sunday of the Good Shepherd reunites the Bishop of Rome and his priests for the Ordination of new priests for the diocese. This is always a great gift of God - it is his grace! Therefore let us reawaken in ourselves a profound sense of faith and acknowledgment in living this celebration today. 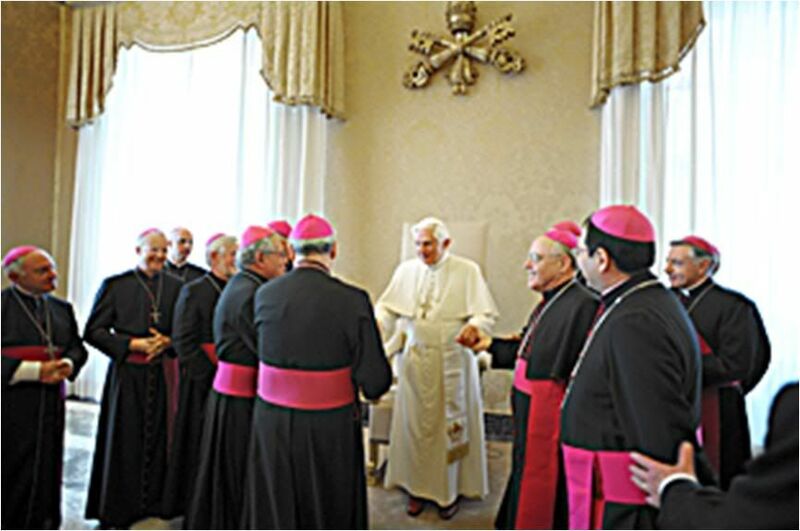 In this atmosphere I am pleased to greet the Cardinal Vicar Agostino Valli, the auxiliary bishops, our other brothers in the Episcopate and in the priesthood, and with special affection, you, dear deacons who are candidates for priesthood, together with your families and friends. The Word of God which we just heard offers us many starting points for meditation: I will cite some of them because they cast an indelible light on the path of your life and on your ministry. "He (Jesus) is...the cornerstone. There is no salvation through anyone else" (Acts 4,11-12). In the passage from the Acts of the Apostles - the first Reading today - a singular 'homonymy' between Peter and Jesus is striking and makes us reflect: Peter, who had received his new name from Jesus himself, says here that it is he, Jesus, who is 'the stone'. Indeed, the one true rock is Jesus. The only name that saves is his. The Apostle, and therefore, the priest, receives his own 'name', namely, his self-identity, from Christ. His 'I' becomes totally relative to the 'I' of Jesus. In the name of Christ, and certainly not in his own name, the apostle can performs acts of healing on his brothers, he can help the 'sick' to get up and walk again (cfr Acts 4,10). In the case of Peter, the miracle he had just performed makes this particularly evident. Even the reference to the words of the Psalm is essential: 'The stone the builders rejected has become the cornerstone" (Ps 117,22). Jesus had been 'rejected', but the Father chose him to be the foundation of the temple of the New Covenant. Thus, the Apostle, like the priest, must experience the cross in his turn, and only through the Cross does he become truly useful in the construction of the Church. God constructs his Church with persons who, following Jesus, place all their confidence in God, as the same Psalm says: "Better to take refuge in the LORD than to put one's trust in mortals. Better to take refuge in the LORD than to put one's trust in princes" (vv 8-9). The same destiny as the Master falls to the disciple, which ultimately is the destiny written in the will of God the Father himself! Jesus confessed it towards the end of his life in the great prayer called 'sacerdotal': "Righteous Father, the world also does not know you, but I know you" (Jn 17,25). Even earlier, he had stated: "No one knows the Father except the Son" (Mt 11,27). Jesus experienced in himself the rejection of God by the world - the incomprehension, the indifference, the disfigurement of the face of God. And Jesus passed on the 'testimony' to his disciples: "I", he confides in the prayer to the Father, "made known to them your name and I will make it known, that the love with which you loved me may be in them and I in them" (Jn 17,26). Therefore, the disciple - especially, the apostle - experiences the same joy as Jesus in knowing the name and the face of the Father, and also shares his pain in seeing that God is not known, that his love is not returned. On the one hand, we exclaim, like John in his first Letter: "See what love the Father has bestowed on us that we may be called the children of God. Yet so we are" (1 Jn 3,1). And on the other, we note with disappointment: "The reason the world does not know us is that it did not know him" (1 Jn 3,1). It is true. We priests experience it. The 'world' - in the Johannine use of the word - does not understand the Christian, it does not understand the ministers of the Gospel. A bit because in fact, it does not know God, and a bit because it does not want to know him. The world does not wish to acknowledge God and listen to his ministers, because this would place it in crisis. Here, we must pay attention to a factual reality: that this 'world', always in the evangelical sense, undermines the Church itself, infecting its members and even its ordained ministers. The 'world' is a mentality, a way of thinking and living that can corrupt the Church itself, and indeed, corrupts it, and thus, it requires constant vigilance and purification. But until God's will has been fully manifested, even his children are not yet 'like him' (1 Jn 3,2). We are 'in' the world and we risk being also 'of' the world. Indeed, at times we are. That is why, in the end, Jesus did not pray for the world, but for his disciples, so that the Father would keep them from evil and they could be free and different from the world, even while living in the world (cfr Jn 17,9.15). At that moment, at the end of the Last Supper, Jesus raised to the Father the prayer of consecration for the apostles and for priests of all time, when he said: "Consecrate them in truth" (Jn 17,17), adding, "And I consecrate myself for them, so that they also may be consecrated in truth" (Jn 17,19). I dwelt on these words of Jesus in the homily of the Chrismal Mass last Maundy Thursday. Today, I reconnect to that reflection, referring to the Gospel of the Good Shepherd, where Jesus says, "I will lay down my life for the sheep" (cfr Jn 10,15.17.18). To become a priest, in the Church, means to enter into this self-giving by Christ, through the Sacrament of Holy Orders, and enter into it with all of oneself. Jesus gave his life for everyone, but in a special way, he consecrated himself for those whom the Father had given him, so that they may be consecrated in truth, namely, in him, and thus be able to speak and actin his name, to represent him, to prolong his salvific actions: to break the Bread of life and remit sins. Thus, the Good Shepherd offered his life for all sheep, but gave it in a special way to those who he himself, "with affection and predilection", called and calls to follow him on the path of pastoral service. Then, in a singular manner, Jesus prayed for Simon Peter, having sacrificed himself for him so that he could say to him one day, on the shore of the lake at Tiberiade, "Feed my sheep" (Jn 21,16-17). Analogously, every priest is the recipient of a personal prayer by Christ and of his sacrifice, and only as such is he made able to collaborate with him in pasturing the flock which belongs wholly and only to the Lord. Here I wish to touch a point that particularly interests me: prayer and its link to service. We have seen that to be ordained a priest means entering in a sacramental and existential way into Christ's prayer for 'his own'. It is from this that we priests derive a particular vocation to prayer in a strongly Christocentric sense: we are called, that is, to 'remain' in Christ - as the evangelist John loves to repeat (cfr Jn 1,35-39; 15,4-10) - and this is realized particularly in prayer. Our ministry is totally linked to this 'remaining' which is equivalent to praying, from which it derives its efficacy. In this perspective, we should think of the different forms of prayer for a priest, first of all, the daily Holy Mass. The Eucharistic celebration is the greatest and highest act of prayer, and constitutes the center and the origin from which even the other forms receive their 'lymph': the liturgy of the hours, Eucharistic adoration, lectio divina, the holy Rosary, meditation. All these expressions of prayer, which have their center in the Eucharist, make real in the priest's day and in his whole life the words of Jesus, "I am the good shepherd, and I know mine and mine know me, just as the Father knows me and I know the Father; and I will lay down my life for the sheep" (Jn 10, 14-15). Indeed, this 'knowing' and 'being known' in Christ and, through him, in the Most Holy Trinity, is none other than the truest and most profound reality of prayer. The priest who prays a lot, and who prays well, becomes progressively expropriated from himself and more united to Jesus the Good Shepherd and Servant of his brothers. In conformity with him, even the priest 'gives his life' for the sheep who are entrusted to him. No one takes his life from him: he offers it himself, in union with Christ the Lord, who has the power to give his life and the power to take it back, not only where it concerns himself, but even for his friends, who are linked to him through the sacrament of Holy Orders. Thus the life of Christ, Lamb and Shepherd, is communicated to all the flock, through his consecrated ministers. Dear Deacons, may the Holy Spirit imprint these divine words that I have briefly commented upon, in your hearts, so that it may bear abundant and laSting fruits. We ask this through the intercession of the holy apostles Peter and Paul and of St. Jean Marie Vianney, the Curate of Ars, under whose patronage I have proclaimed the coming Year of the Priest. May it be obtained for you by the Mother of the Good Shepherd, the Most Blessed Mary. In every circumstance of your life, look to her, the star of your priesthood. As she did to the servants at the wedding in Cana, Mary repeats to you as well: "Do whatever he tells you" (Jn 2,5). At the school of the Virgin, may you always be men of prayer and service in order to become, in the faithful exercise of your ministry, holy priests after God's own heart.